Both width and length are small. Although there is thickness of the product, it is fluffy, so it will become thin as soon as you start using it. Although it is with felt, it looks like synthetic fiber instead of wool. So it was not useful at all for the cold weather. This review is about item#36676367. Although it does not get in the way with a moderate thickness, you can work as warm and comfortable as it is. Although it is size free, if it is shoes of 27 cm or more, it moves in the shoes. 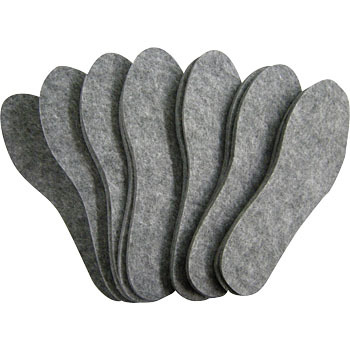 Because it is a felt with thickness, cushioning property and heat retention property are very good, but unfortunately it was not suitable for on-site work as it was easy to slip when stepping on.